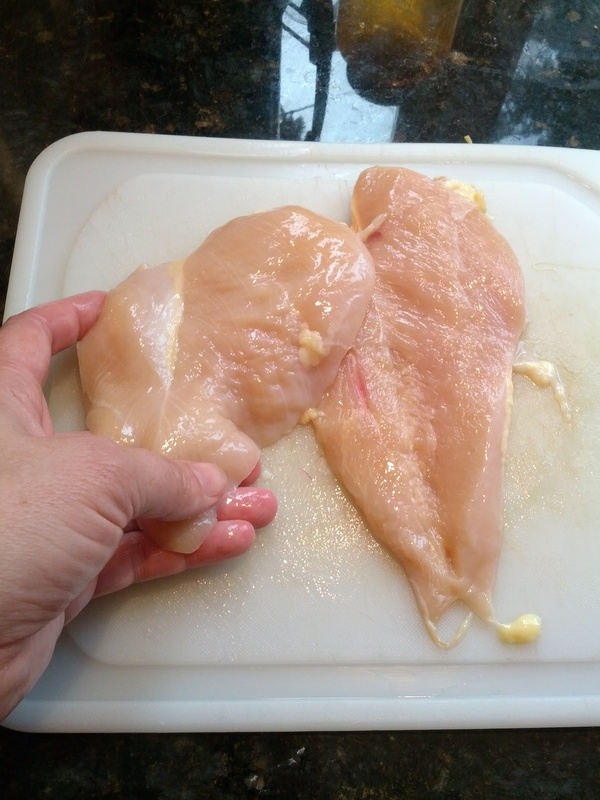 We don’t have it very often except for when I find a good deal on Boneless Skinless Chicken Breasts. It takes some time to prep but I have found a couple tricks that make it easier. 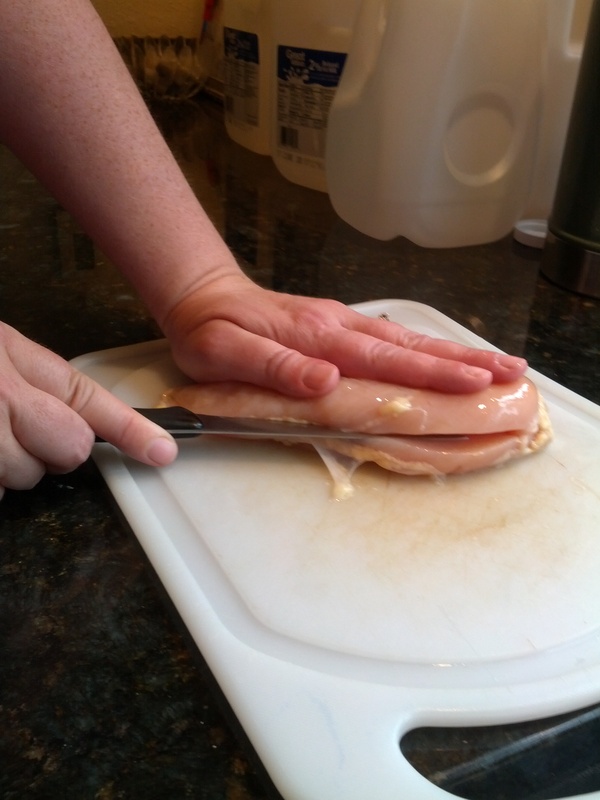 First, If you have have thick Chicken Breast pieces you will want to slice them horizontally into two. If you have a skinnier one you can simply skip the cutting step and carefully pound each one to an equal thickness. Cutting a BSCB horizontally can take practice. This is how I do it to make it easier. 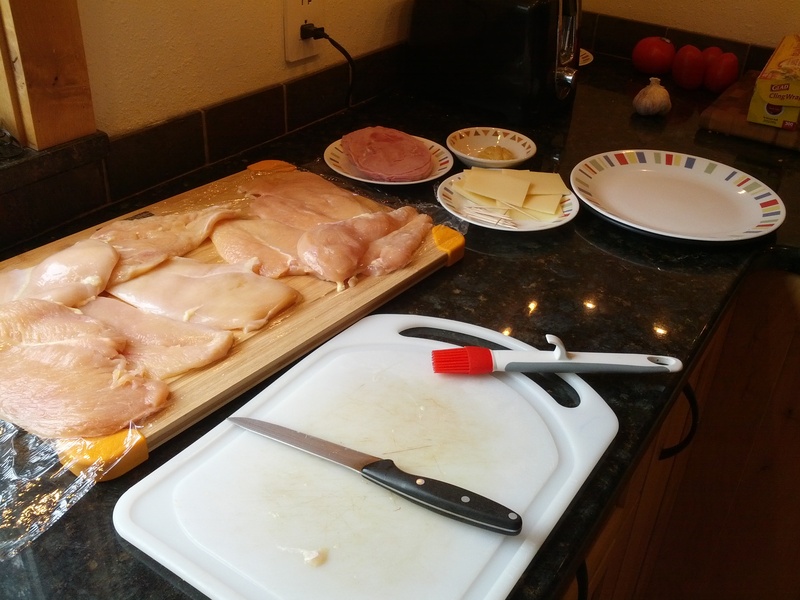 First I cut a line around the BSCB at the half way mark, like shown, going all the way around the outside.You don’t see me doing it in the picture but I get my head down even with the chicken so I can easily see what I am doing and I slowly slice that halfway line. Next, I cut the inside section between those side slices by sliding my knife through. (see picture). 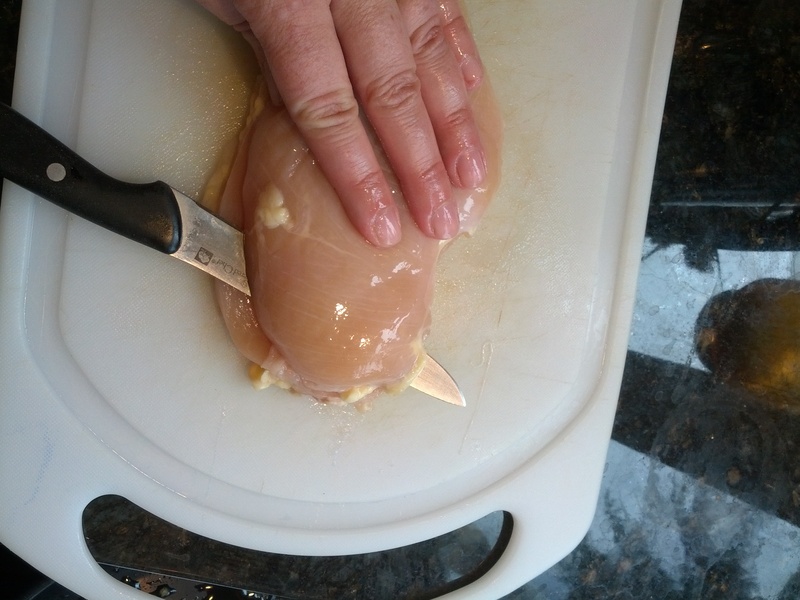 If you keep the chicken on the board and slide your knife following those slits (always keeping your knife visible on both sides) it will naturally complete your cut. Now you have two nice thin pieces. I even my pieces out by GENTLY pounding them into an even thickness. If you don’t have a specific tool for this a 8″pan or a pot work well also. I don’t want chicken liquids splashing around my kitchen so I cover it . I slide mine into a gallon baggy cut down one of the sides or you could use plastic wrap. You need to pound gently because you can rip them easily (Especially that bottom piece). If I get a slight hole I just move on. If it is too big it will need to be used for another recipe. Now that all of your pieces are cut and flat, assemble your needed ingredients for the next step. You will need: a couple Tablespoons of Dijon mustard, a basting brush, Ham slices and Swiss cheese slices equal to your number of BSCB sections, toothpicks (two per piece). I also have a plate for my finished rolls and a work surface. I put all this out before assembly because you don’t want to be getting chicken juices all over your mustard or other storage containers. I am very careful about cleaning up chicken mess thoroughly. I don’t want to risk making my family sick. Now for making the rolls…. First spread a layer of Dijon mustard on your BSCB. 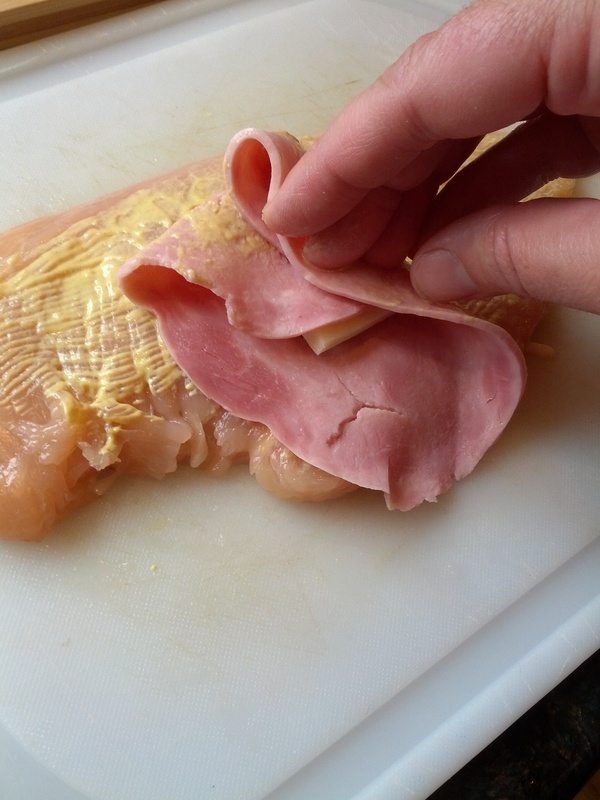 Then take a piece of ham and place your swiss in the middle. This works great if you have a thin sliced piece of ham. It isn’t necessary to wrap them together but I find it helps the swiss stay in the roll during cooking. 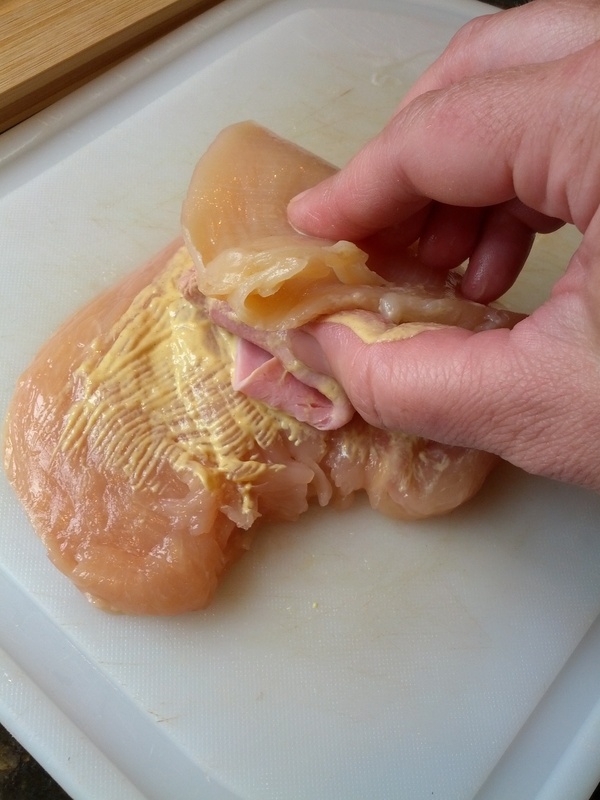 Next wrap your chicken around the piece of ham/swiss. Secure the ends together with two toothpicks. Here is the tip/trick! I used to just coat the rolls at this point and bake them.You can do this but I found all my cheese would leak out and my rolls would be just ham and chicken. If you take the time to wrap each tightly in plastic wrap, folding in those loose ends of BSCB into the middle, and making a little cocoon for your ham and swiss… then most of your cheese will stay in the roll during cooking. … let them sit for at least a couple hours in the fridge then your loose roll will stay in that tight formation you created in the plastic wrap. I like to make the rolls in the AM and this makes for quick dinner prep later. Again assemble your ingredients before you unwrap your rolls for each assembly. You need: melted butter in a shallow dish (I used 6 Tbsp for these 8 rolls), Bread crumbs in a shallow dish ( approx. 1 1/2 cups, fresh or store bought, I prefer Panko bread crumbs or homemade) and your baking dish. You can add shredded Parmesan cheese to your breadcrumbs for an added yum. The extra bowl in the picture is my extra bread crumbs. 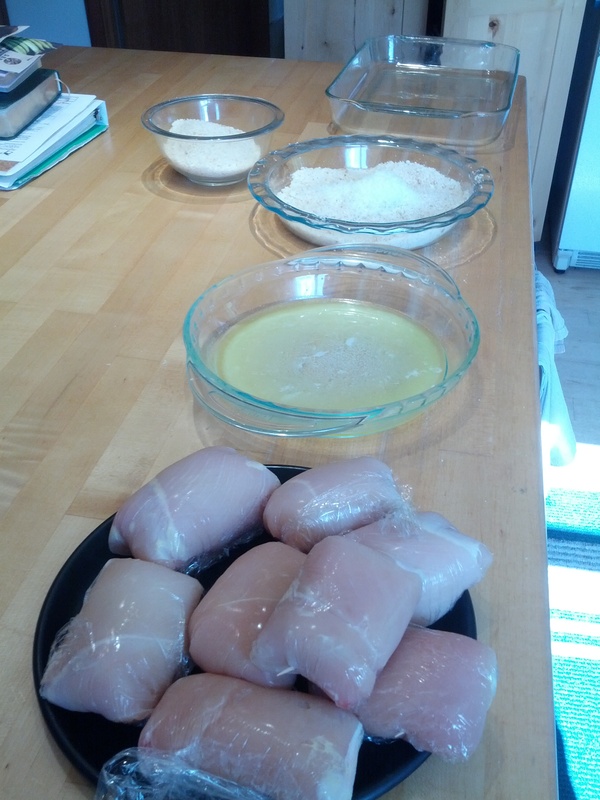 I started with alot and didn’t want to get chicken and butter “goop” on all of them and then have to throw a lot out. Turned out the ones in the bowl were extra so I froze them for later. Then, Coat in bread crumbs. Pressing them down into the ends and on the outsides for a good coating. TIP: I use one hand for the” goopy/wet” job and the other only for the “dry” bread crumb job. That way I don’t have about 15 layers of goopy mess on my hands when I am done. Place them in a baking dish without them touching to allow even baking and bake at 350° for 30-40 minutes until chicken is cooked all the way through. Here is what the finished inside looks like. Yum! Preheat oven to 350°. Placing rack in middle position. If using thick BSCB then slice horizontally into two equal thin pieces. 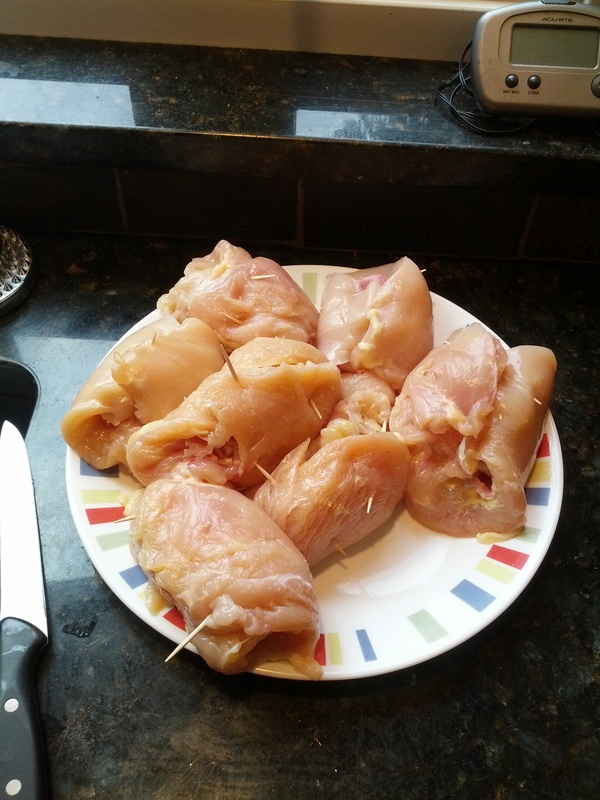 Place each cutlet in a gallon bag or a layer of plastic wrap and pound gently to an even thickness. Spread a layer of Dijon on the top side of one of your BSCB. 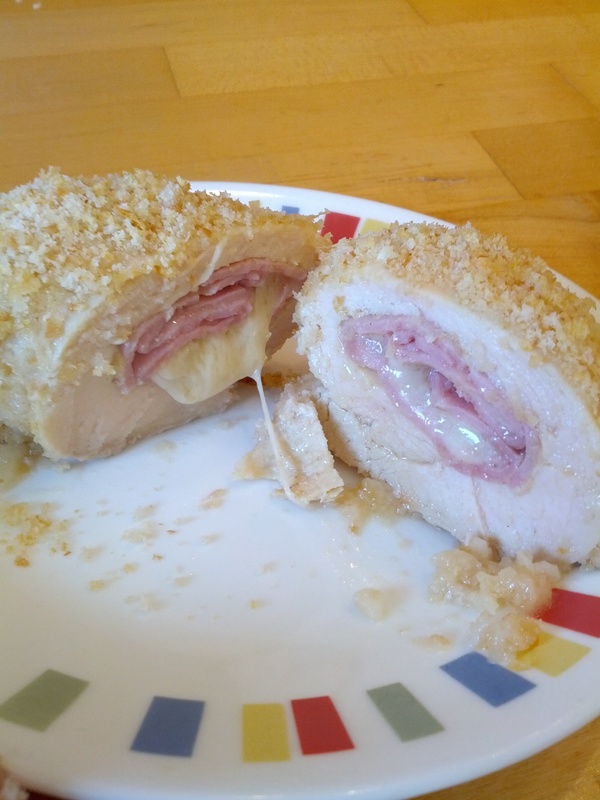 Roll a piece of Swiss cheese inside a piece of ham. Place in the middle of your BSCB. Roll the BSCB around the ham/cheese and secure with toothpicks. Repeat with each BSCB piece. 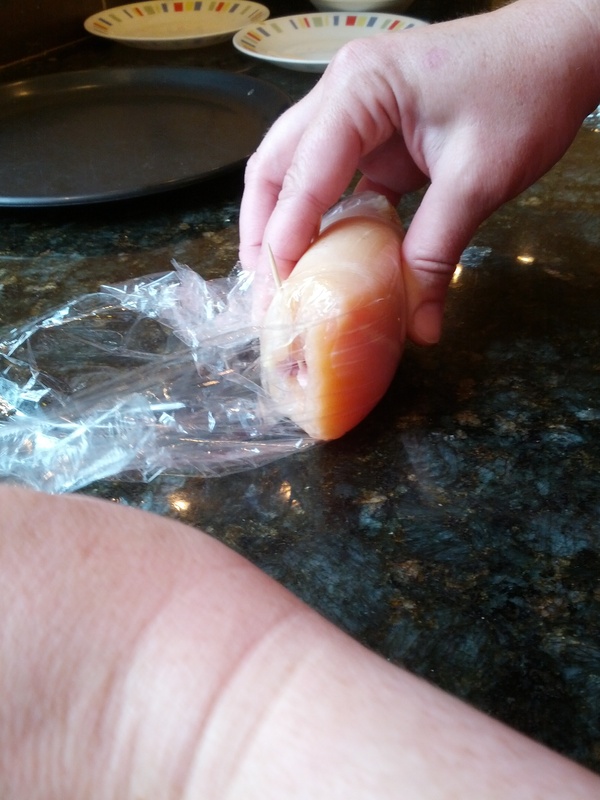 Wrap each Chicken roll tightly in plastic wrap pulling sides of chicken into the middle to wrap around the ham. Place in fridge for at least two hours or overnight. Set up dishes for breading. Melt butter in a shallow dish. 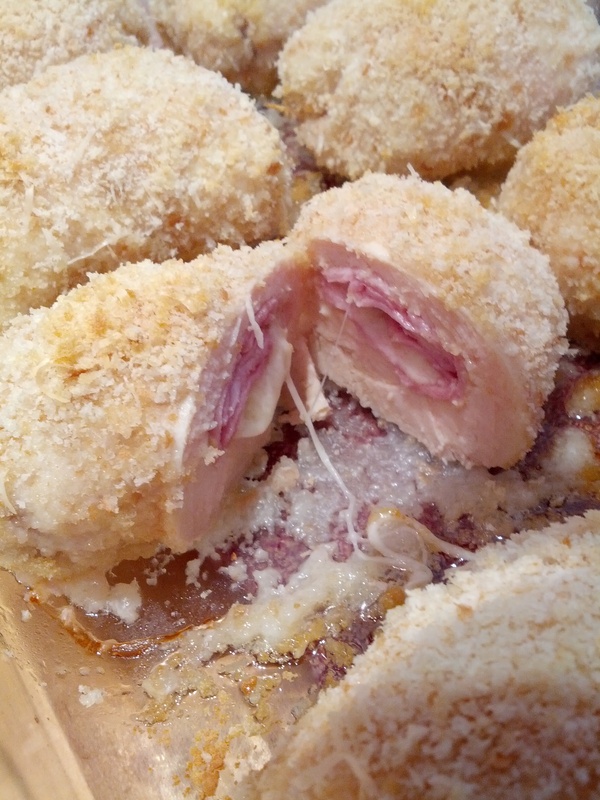 Place Bread crumbs and Parmesan (optional) in separate shallow dish. Unwrap each roll. Coat with butter. 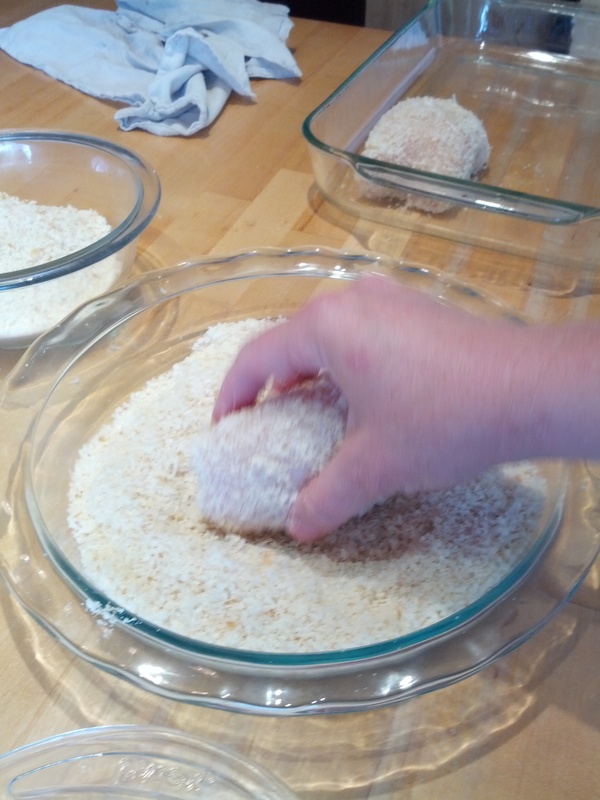 Then, coat with bread crumbs, pressing on crumbs to help them adhere. Place in large baking dish. Repeat with each chicken roll. Bake at 350° for 30-40 minutes until chicken in cooked in the middle. Serve and Enjoy!